Time for a quick snack! 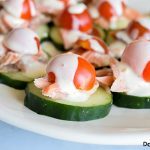 Cucumber & smoked salmon snackers, complete with a bit of tomato and a honey mustard sauce made with Primal Kitchen products. Arrange cucumber slices on a platter. In a small bowl, stir together mayo and honey mustard vinaigrette until smooth. Top the cucumber slices with 1-2 Tb smoked salmon. Then add a grape tomato half on top. Just before serving, drizzle with honey mustard sauce to finish them off.